Set during WWII's Battle of Bulge, Battleground is an award winning box office hit that delves beneath the gritty surface action of guns and bombs, portraying the story of the true human experience and shedding light on under told aspects of war. The focus of the film lies on the soldiers of a company in the 327th Glider Infantry Regiment, 101st Airborne Division as they toil through the Siege of Bastogne, depicting their courage in battle along with their doubts, fears and vulnerability as human beings, setting this movie apart from the rest because of its grim honesty. 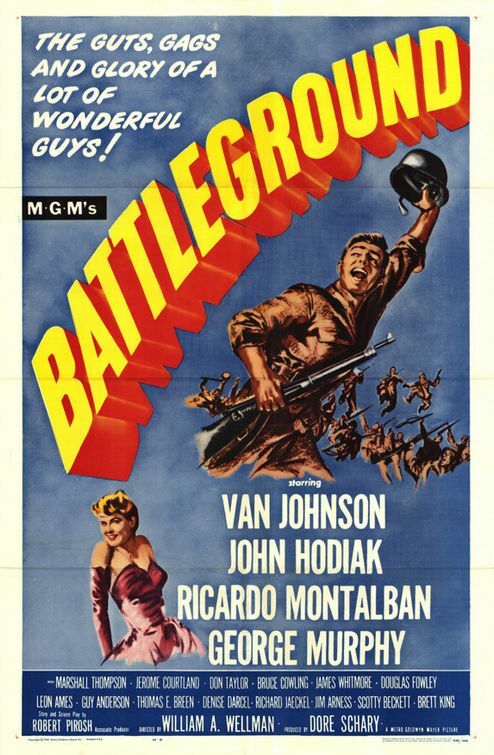 Directed by William Wellman, Battleground stars John Hodiak, George Murphy, James Whitmore, Van Johnson, Ricardo Montalban and won two Oscars for Cinematography and Best Writing, Story and Screenplay along with two Golden Globes for Best Screenplay and Best Supporting Actor to James Whitmore. Considered the first eminent film to be released after the end of the war, Battleground fuses an honest portrayal of American soldiers with spectacular wartime reenactments making it a Cockpit USA favorite and Movie Monday pick of the week! This entry was posted in Movie Monday and tagged behind the scenes, cockpit usa, WWII, Movie Monday, Battleground, Battle of Bulge, 327th Glider Infantry Regiment, 101st Airborne Division, Siege of Bastogne, William Wellman, John Hodiak, George Murphy, James Whitmore, Van Johnson, Ricardo Montalban on March 11, 2013 by Cockpit USA Staff. Directed by Jack Smight and starring a glittering cast including Henry Fonda, Charlton Heston, Robert Wagner and Christina Kokubo, Midway is an action packed WWII film that checks all the boxes. Centered around the Battle of Midway against the Imperial Japanese Navy in the Pacific, the film simultaneously follows both sides from chief strategist Admiral Isoroku Yamamoto and Captain Matt Garth of the American forces in the planning and execution of the pivotal encounter. With a dash of romance and a generous dose of combat action, this is the perfect war film for a chilly Monday evening! Cockpit USA approved. This entry was posted in Movie Monday and tagged WWII, Midway, Battle of Midway, Henry Fonda, Charlton Heston, Robert Wagner, Christina Kokubo, Jack Smight on March 4, 2013 by Cockpit USA Staff. Set in Luzon in the Philippines, Back to Bataan is a WWII movie based on true events that took place in the aftermath of the Battle of Bataan between 1941 and 1942. Directed by Edward Dmytryk and starring Hollywood royalty John Wayne, Anthony Quinn and Fely Franquelli, this 1945 movie is a dramatic concoction of real and fictional tales including resistance battle, guerrilla fighting and POW rescue missions along with spies, propaganda and apparent treason creating a mile a minute movie set to keep you on the edge of your seat! This entry was posted in Movie Monday and tagged cockpit usa, WWII, John Wayne, The Cockpit, The Battle of Bataan on February 11, 2013 by Cockpit USA Staff. A biographical film based on a real memoir penned by U.S. Marine Anthony Swofford, this 2005 war drama centers in on the chaos and madness experienced by a young Marine. Entitled Jarhead after the novel of the same name and taken from the slang term used to reference U.S. Marines, this movie boasts a whole host of Hollywood names including Jake Gyllenhaal, Jamie Foxx, Peter Sarsgaard and Chris Cooper. Set during the Gulf War in 1991, the action follows Anthony "Swoff" Swofford as he signs on, endures the rigors of training as a sniper at boot camp then lands in the middle of a desert, encountering an unseen enemy and a completely . Not for the faint hearted, Jarhead is a hard hitting and true to life movie which struck a cord with Cockpit USA making it the Movie Monday pick for this week! This entry was posted in Movie Monday and tagged cockpit usa, Movie Monday, The Cockpit, jarhead, jake gyllenhaal, jamie foxx, peter sarsgaard, chris cooper, sam mendes on February 4, 2013 by Cockpit USA Staff. With the snappy cold weather we've been having this week, we at Cockpit USA are in desperate need of a dose of warmth and what better way to turn up the temperature than with some belly tickling comedy? 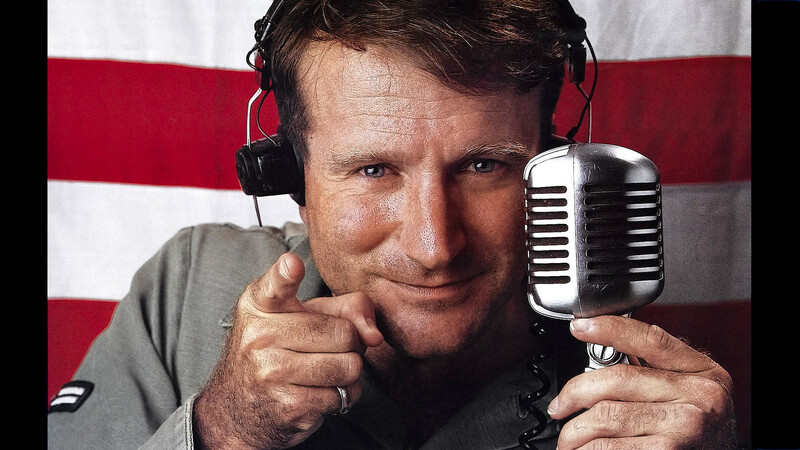 Set during the Vietnam war in Saigon in 1965, Good Morning, Vietnam is an American comedy war movie starring Robin Williams as a radio DJ on the Armed Forces Radio Service. While proving to be a huge hit with the listening masses, Airman First Class Adrian Cronauer (Williams) manages to annoy and rile the nerves of his superiors by divulging censored information and initiating confrontations, causing riots and mayhem. A natural comedian, funny man Williams' hilarious radio broadcasts were mainly improvised, earning him an Academy Award nomination for Best Actor in a Leading Role. So, lock your doors, bundle up and settle down with a mug of cocoa and this rip roaring Movie Monday pick! This entry was posted in Movie Monday and tagged cockpit usa, Movie Monday, Vietnam War, War Movie, The Cockpit, good morning vietnam, academy award, oscars, robin williams on January 28, 2013 by Cockpit USA Staff. In a shift from the normal war movies we feature, this Movie Monday's pick is a quirky comedy about a troop of WWII soldiers who go AWOL to rob a bank behind enemy lines. Starring Clint Eastwood in the role of the movie's main protagonist Kelly alongside Telly Savalas, Don Rickles, Carroll O'Connor, and Donald Sutherland, Kelly's Heroes follows three rogue soldiers from units of the 35th Infantry Division as they go in search of millions of dollars in gold bars. Told of the booty by a captured German officer, Kelly and his men sneak into enemy territory encountering a whole host of belly tickling and edge of the seat action. One to warm up a cold Monday in January, Kelly's Heroes is Cockpit USA's movie choice of the week! This entry was posted in Movie Monday and tagged cockpit usa, WWII, WWII movie, Movie Monday, Clint Eastwood, The Cockpit, kellys heroes on January 21, 2013 by Cockpit USA Staff. 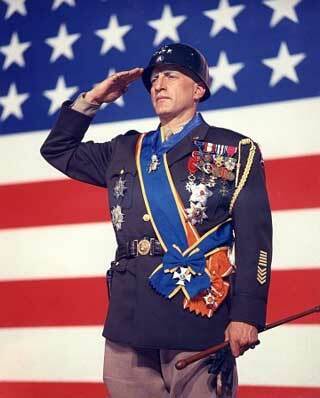 Officially labelled as "culturally, historically, or aesthetically significant" in 2003 by the Library of Congress, Patton is without a doubt a contender for the Cockpit USA Movie Monday hall of fame. Based on U.S. General S. Patton's experiences during WWII, this 1970 American biographical war film is the ultimate classic. Starring George C. Scott, Karl Malden, Michael Bates, and Karl Michael Vogler, directed by Franklin J. Schaffner with a script by the one and only Francis Ford Coppola and Edmund H. North - it is no wonder this movie won a phenomenal seven Academy Awards! From the opening moments which feature a monologue by George C. Scott as General Patton standing with pride in front of an American flag, to the planes of North Africa and all over Europe, Patton provides an unparalleled cinematic experience that unravels the story of the great man himself. This entry was posted in Movie Monday and tagged cockpit usa, flight jacket, WWII, Movie Monday, George S Patton, War Movie, The Cockpit, patton on January 14, 2013 by Cockpit USA Staff. Known as the great Frank Sinatra's most successful movie, Von Ryan's Express is an adventure packed feat not to be missed! Set during World War II, this 1965 film tells the tale of a squadron of mainly British Allied prisoners who plan, plot and execute a daring mass escape from a prison camp led by a tenacious and determined American Air Force colonel, hijacking a freight train and fleeing through German occupied Italy to Switzerland. Although based on the book by David Westheimer, Von Ryan's Express takes a detour from the plot of the novel, with an entirely different ending and a more upbeat tone altogether. Starring Frank Sinatra and Trevor Howard and directed by Mark Robson, this is one fast paced, suspenseful and stunt studded piece of film perfect for an otherwise quiet Monday in January. Cockpit USA approved! This entry was posted in Movie Monday and tagged cockpit usa, Movie Monday, The Cockpit, frank sinatra, von ryans express on January 7, 2013 by Cockpit USA Staff. Set on the Western Front during WWI, The Blue Max is a British war film which recounts the unceasing determination of a German fighter pilot from a humble background, against all class and status barriers to achieve the highly coveted Pour le Mérite. With his sights set firmly on attaining Imperial Germany’s highest military honor for valor, also known as the ‘Blue Max’, the young German Corporal Bruno Stachel swaps the trenches for the cockpit, joining the German Army Air Service and beginning his mission to shoot down 20 aircraft to win the medal. Directed by John Guillermin and starring George Peppard as the lead along with James Mason, Ursula Andress, Karl Michael Vogler and Jeremy Kemp, The Blue Max is an aviation movie which shows off old school film making at its best, making it perfect for history enthusiasts in every aspect! Cockpit USA approved. This entry was posted in Movie Monday and tagged cockpit usa, Movie Monday, WWI, The Cockpit, The Blue Max, Aviation Movie, German Army Air Service, Western Front on December 31, 2012 by Cockpit USA Staff.